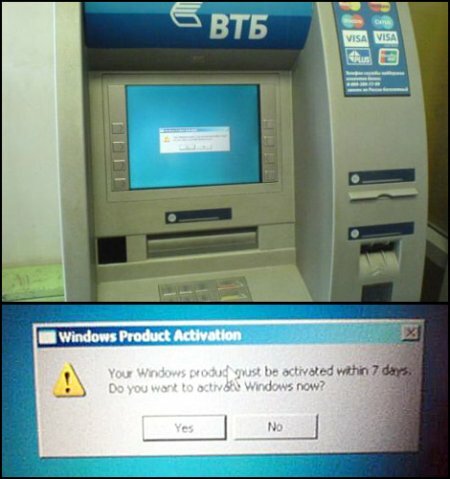 Now this is truly hilarious – an ATM machine in Russia “pleading” with users to activate this particular copy of Windows within seven days. What a hoot! I didn’t know banks in Russia actually used the services of street vendors who are known as notorious software pirates. Do you have any funny ATM stories to share with us? Kindly leave a comment below if the answer is in the affirmative. Budget GeForce 8500GT on the way? It most likely just a simple photo-shop fake. Yeah, or it could be yet another example of Microsoft’s activation software causing an error. This is why you should be putting a more secure operating system that isn’t susceptible to WGA/Activation/Paranoia. It’s an NCR atm. Probobally running their APRTA software which is sometimes difficult to configure properly. might also note that the keypad is an older style which no longer conforms to network standards due to encryption shortcomings. my God, i thought you were going to chip in with some decisive insght at the end there, not leave it with we leave it to you to decide.